Time to prime things up. We used Zinsser 1-2-3 Bullseye. 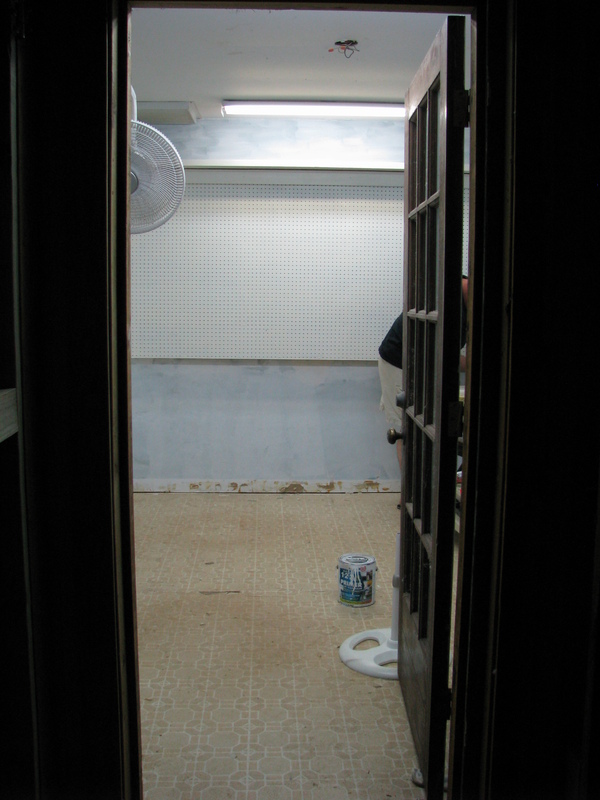 And here we begin to cut in with our paint. I love, love, love turquoise. 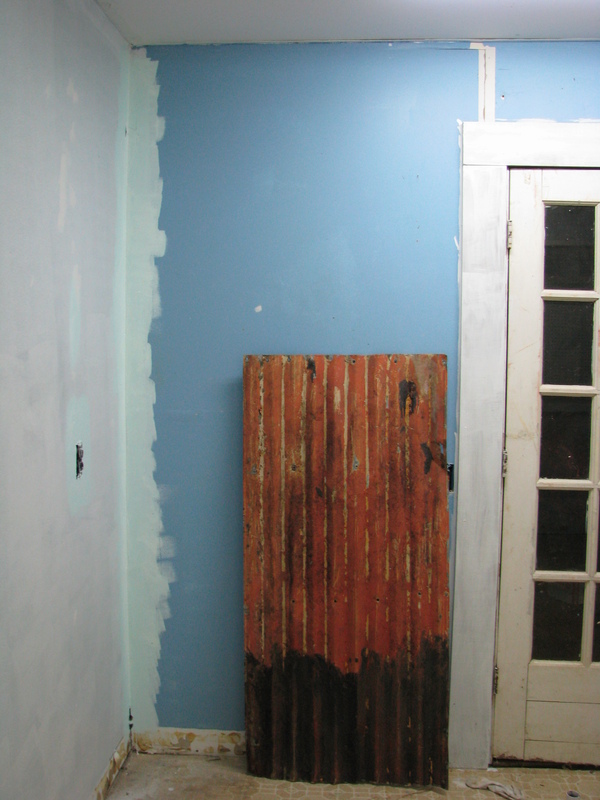 Is it original to paint your craft room turquoise? NO. But I don’t care. Turquoise is in my own made-up holy trinity of colors consisting of: Red, Peace yellow, and Turquoise. It’s what I love! I thought about light yellow walls, but I also wanted something more relaxing. So, I went with blue. To be exact, it’s a Glidden color from Wal-Mart. Something like Aqua Seacrest or something like that. I’ve slept since then. I just knew I wanted it when I saw it! 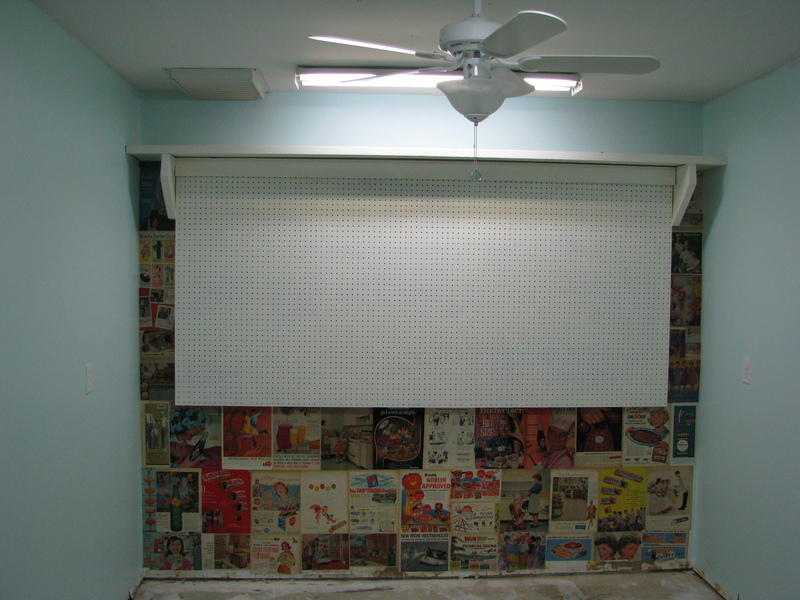 Here is some more detail to that shelving/pegboard. The shelf is actually 2 inches thick. It’s a leftover piece to when we re-sided our house with cypress. Gotta be STRONG to hold up those old sewing machines! *note the beer bottle. “Build it, and he will drink.” Wait…that’s not right. Is it? Now is that some fun or what? I love the hot pink in the ads, plus my ‘Holy Trinity of Colors’. 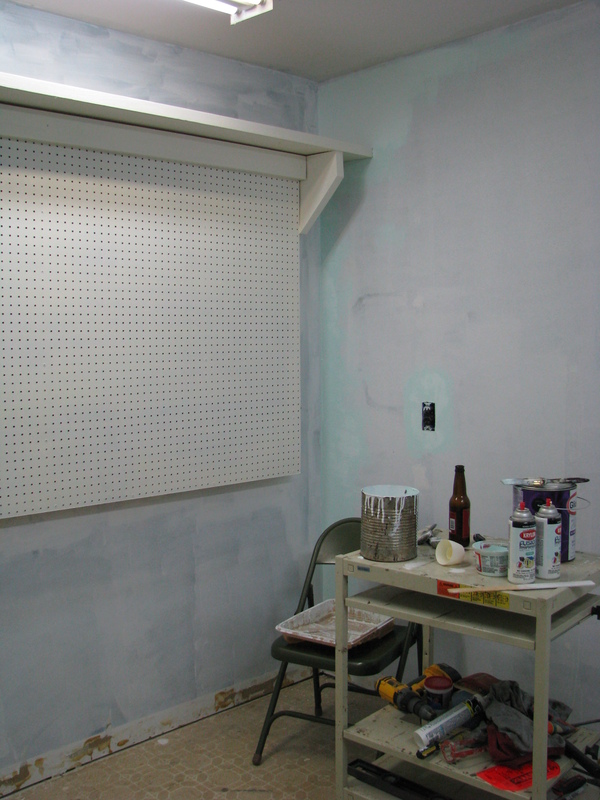 Now you can see why I went with Dover White on that pegboard. I didn’t need any more color! You can also see Jason installed my fan (not really a vintage looking fan, but hey, it was all we had in town). Time to add something else…some old tin to the back wall. We scavenged this tin off of the back part of our property, which we have deemed “Appliance Hill”. Previous property owners had dumped tons of junk back there, including this cool tin. I wanted to have a magnetic surface in my room to put up patterns/whathaveyou. Now came baseboards (1″x6″ boards) and ‘crown moulding’ (1″x4″ boards). 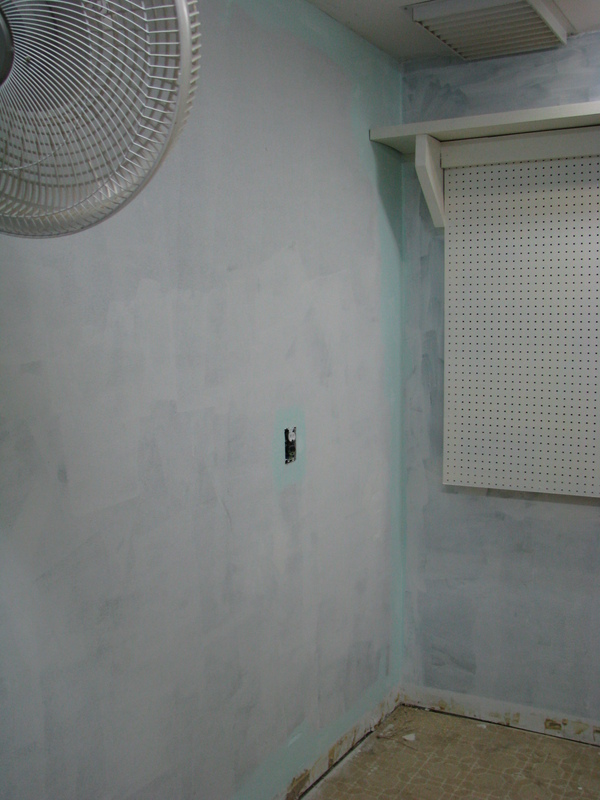 And then caulk…lots of caulk. Fortunately, I’m the Caulk Queen (a self-designated title), so that went quickly. I also wanted a chalkboard surface, just for some fun, so the back of the existing door was painted with Krylon latex chalkboard paint (2 coats). The last picture was taken on October 1st. The next weekend, we went and picked out flooring. There was a laminate flooring on clearance for 28 cents a square foot (!!! ), but I reeeeeally didn’t like it. It just oozed “Cheap”. And you know you shouldn’t ever ooze ‘Cheap’. At least that’s what my mom always told me. Anyhoo, I went with a $1.69 sq/ft plastic laminate that had a ‘hand-scraped’ look and I looooove it. We put it in by the next day. So yes, most of this was done in about oh…5 days total!